Permafrost is a phenomenon directly related to climate. It is soil (or rock) that remains at or below the normal freezing point of water (<0°C) for two or more consecutive years (Harris 1988, Davis 2001, French 2007). Its presence depends mainly on the mean annual temperature at the soil surface, which has to be equal or less than 0°C (with rare exceptions). Permafrost covers 23% to 25% of the northern hemisphere (Zhang et al. 2008) and much of it is thousands of years old (Davis 2001). The geographic distribution of permafrost is associated with basic factors that define regional and local surface climate conditions: air temperature, precipitation, topography, types of vegetation cover, soil organic layers and, particularly, snow cover thickness and duration. 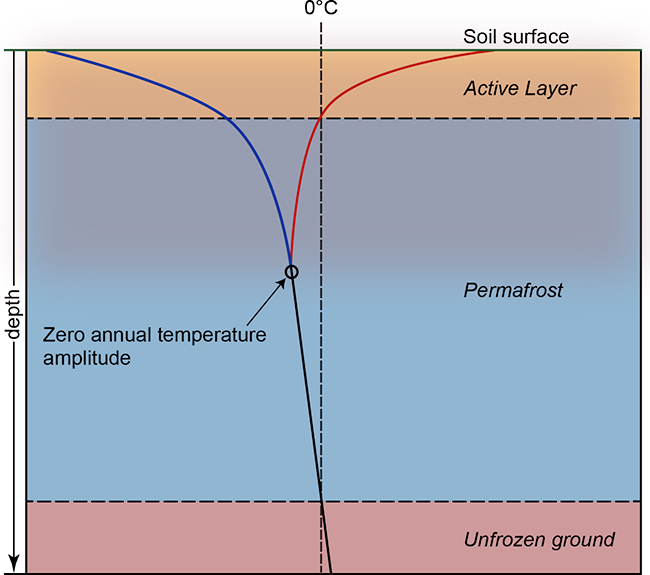 The zone of sporadic permafrost is mainly confined in peat-lands because of the thermal offset effect related to peat’s thermal properties (i.e. peat cools easily when frozen in winter and is a good insulator that prevents warming in summer) (Brown 1970; Burn 1988). Hilltops devoid of snow cover due to blowing winds are also sites likely to be underlain by permafrost in the discontinuous zone. The zone of discontinuous permafrost is broadly contained between latitudes 56° and 58°N while the zone of continuous permafrost extends northward where annual temperatures prevailing since deglaciation allowed permafrost to reach depths over 150 meters (e.g. Tasiujaq) and even as deep as 590 m at the Raglan mine (Allard and Seguin 1987, Chouinard et al. 2007)). In permafrost regions, the ground is characterised by two main layers: the active layer that thaws every summer and the underlying permafrost that remains below 0°C year round (French 2007, Williams and Smith 1989). Both the active layer and the permafrost are affected by seasonal temperature variations (see figure below), but only the active layer undergoes seasonal thawing (Washburn 1979, Williams and Smith 1989). It is also recognized that the stratigraphic unconformity between the active layer and the permafrost (termed the permafrost table) shifts upwards or downwards over periods of several years following climate variations. One exceptionally warm summer may lead to a thicker active layer. Consequently, the amount of ice near the permafrost table can vary within only a short period encompassing only a few years (Shur and Jorgenson, 2007). Deeper in the permafrost, the maximum depth affected by the annual temperature variations is called the depth of zero annual amplitude (Figure 1); it varies with air temperature and the type of soil (Pissart 1987, French 2007). In Nunavik for instance, it is about 22 m deep in bedrock, somewhat less in sands, and 5-6 m deep in clays (Lévesque et al. 1990). Why permafrost stability is so important for Arctic landscapes? Permafrost is the key factor that makes Arctic lands particularly sensitive to climate changes (ACIA 2005). This is in large part because the ice-bearing frozen ground is the physical support for terrestrial ecosystems. Under the influence of larger heat transfer in the ground from the warming atmosphere, permafrost thaws and may become unstable: the terrain often settles, soil drainage conditions are altered (either becoming dryer when water percolates deeper in coarse soils or wetter when the fine-grained ice-rich substrate remains impervious), various slope processes are triggered (such as active layer slides), hollows and ponds are created, and so on. Inevitably, the ecosystem structure changes; and its functioning also changes as increased ground and surface temperatures drive environmental biochemical processes at higher energy levels. Similarly, frozen ground used to provide a solid base for supporting man-made infrastructures. But permafrost thawing now threatens the integrity of municipal, transportation and industrial infrastructures. Engineering methods designed to either preserve permafrost or to adapt infrastructures to loss of frozen ground support have to be applied with increased care and meticulous planning. Understanding the impact of climate change on the natural environment and dealing with maintenance and development of infrastructures call for a better appraisal of permafrost conditions over the territory. Recent applied research has already provided some important knowledge regarding the direct impacts of permafrost degradation associated with the accelerated warming recorded in the last decades (Allard et al. 2007, 2009, ACIA 2005, Calmels et al. 2008, Smith et al., 2010). Climate model projections indicate that this trend will continue to prevail, or even accelerate over the coming decades (Sushama et al. 2007, IPCC 2007, Brown et al. 2012). Climate change comes at a time when intense industrial development - particularly linked to mining - and fast growing Inuit populations call for new facilities such as roads, airstrips and railways, hundreds of new housing units in communities along with related service buildings and urban expansion. Huge investments are being made by both governments and the private sector for long-lasting infrastructures. Particularly, the pace of community expansion highlights the need for the establishment of sustainable community development plans to ensure healthy communities. Urban planning in northern communities needs to reflect the importance and influence that the extreme climate and the highly sensitive nature of the landscape have on development (Forbes et al. 2007, Irvine et al. 2009, Ford et al. 2010). From a sustainable development perspective, it is critical that northern communities adopt specific adaptation techniques and strategies to deal with warming permafrost in order to preserve or expand their current residential, commercial, municipal, and transportation infrastructures.